Since adopting the paleo lifestyle, I have been ravenous most of the time. It requires adequate planning in advance, with enough variety to keep things from heading to boredom-ville. This recipe, if you could even call it that, is simple and easy. All you need is good quality chicken. I can’t emphasise enough the importance of quality ingredients: free-range chicken. If you have that, you can do no wrong. I learnt butchering chicken while growing up so I use whole chicken all the time. You get a variety of textures and flavours from the different cuts. My favourites are thighs and chicken oysters. The alternative is to buy your favourite cuts but as it is free-range, it might cost you and arm and a leg. Best tip is to get a good quality cleaver and get over your fears of butchering. I also include most of the skin now. 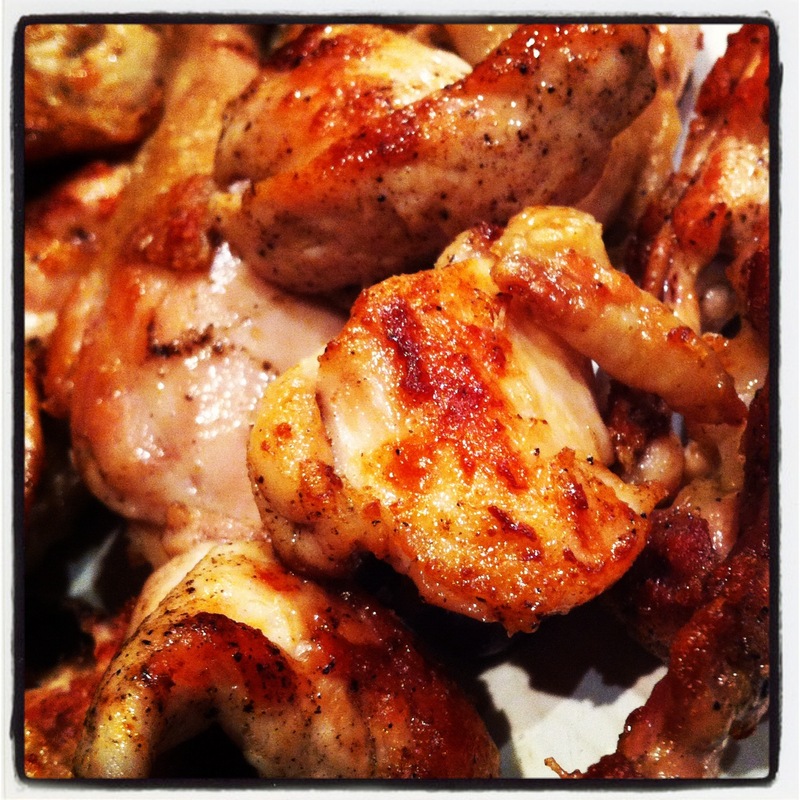 If you have good quality chicken, you get good quality fats (e.g., omega 3). I should add that crispy chicken skin is food for the gods. It literally is. Place your cuts in a bowl. Pour in 1 tablespoon of good quality olive oil, salt and lots of pepper. Let sit for 30 minutes, although overnight is better. Heat a heavy pan and cook the cuts with bones first (legs, back, wings, and thighs if you have not de-boned them). No need to add oil if you left the skin on. Fat will render out and make the skin crispy. Cover to steam/fry for about 10 minutes. Add in the boneless bits thereafter. Turn every now and again for the next 10-15 minutes to make sure they get browned evenly. Drain and sprinkle with smoked sea salt.